Powersoft demonstrated its next generation of its class-D amplifiers and moving magnet linear technology at listening sessions on the Powersoft Roadshow in Los Angeles and San Francisco on November 18 and 20. The company's M-System utilizes a patented M-Force motor transducer, M-Drive switching mode amplifier module, and Differential Pressure Control (DPC) technology to reproduce 150 dB SPL or more out of a single cabinet. "M-Force represents the pinnacle of all of Powersoft's engineering developments that have transpired over the last 20 years," said Paul Freudenberg, U.S. general manager at Powersoft. "There are limitations to the conventional amplifier and transducer model, and M-Force changes that paradigm with a specialized, purpose-built linear motor and a specialized amplifier. The result is an unparalleled amount of force, power, and sonic efficiency in a very small enclosure. "Each of the presentations also included a demonstration of Powersoft's K Series and X Series amplifier lines and its Armonia DSP and control software. "This roadshow — which we expect will continue into 2016 — takes Powersoft's message of performance and efficiency to companies that are at the top of their game in areas such as live sound providers, systems integrators, and OEM manufacturers," saod Freudenberg. "As Powersoft does not manufacture loudspeakers, this represents a vast opportunity for the market at large." The system consists of M-Force, a transducer based on a patented Moving Magnet Linear Motor structure, and M-Drive, an amplifier module specifically designed to capitalize on the potential of M-Force technology. 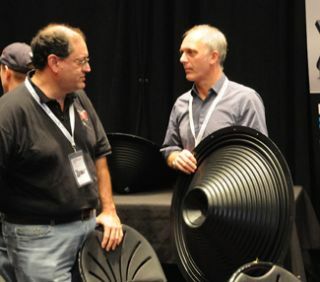 The M-System was a core component of the largest subwoofer installation in the world, which occurred at Hollywood's Avalon Sound in 2015. The technology was also used for the red carpet event at the GRAMMY Awards in February 2015. Brad Katz, system programmer at San Francisco-based JK Sound, said, "The M-Force is very exciting and it is nice to see such a breakthrough in driver technology. Coming from an install background, it is very important to fit a lot of sub in a small footprint — this is key in the nightclub industry, for example."